Over the last weekend the HackTown festival took place in Santa Rita do Sapucaí, a small town with 40 thousand people in Minas Gerais. HackTown is considered the “brazilian SXSW”, with people from all over the country & few foreigners coming over to enjoy the festival. The festival takes place from the 5th until the 9th of September, over Brazil’s independence day holiday. Santa Rita do Sapucaí is well known for hosting INATEL, Brazil’s National Institute of Communications. The institution is well known for its electrical engineering and telecommunications education and research. But, how did a small town became a tech hub in Brazil? This significant change begun in 1950’s when Sinhá Moreira, the wife of a diplomat and an aristocrat’s daughter, came back to Santa Rita do Sapucaí after living years with her husband in countries like US, Japan, and China. Sinhá Moreira came back with the belief that the future moved towards innovation & technology. She was a political activist and dedicated all her life to creating Latin America’s first Electronic Technical School. Telling a long story short, Santa Rita’s slogan nowadays is “creative city – happy city.” The city has more than 195 companies, all somehow related to innovation & technology. Behind all this story, we got the message that a group of citizens can, indeed, make a difference for their community. Great people surrounded Sinhá Moreira, and she changed her hometown’s story. With this story in mind, it was a pleasure for us to be part of the first hackathon on the HackTown. When we knew that the event would have blockchain as their theme, we did our best to secure that EOS would be the platform that the teams would use & learn about. Over 40 participants attended the event. It was such a fantastic experience to see how they all worked hard for 24 hours to deliver cool projects. The hackathon’s challenge was to create a dApp to cause positive social & environmental impact using EOSIO. The event had a qualifying phase where the experts would choose the three best projects. Then they presented to the crowd on the BlockSpace, a space on HackTown entirely dedicated to blockchain projects/debates/speakers. The best projects won more than R$3.000 reais on prizes. But everyone got the most important prize: they all left the hackathon different then they entered. It was amazing to see the participants curious about the possibilities that decentralized business models allow us. Our participation during the HackTown didn’t end with the hackathon. Luiz Hadad, our head of community, facilitated a workshop about Blockchain Governance and talked about our experience working on EOS. 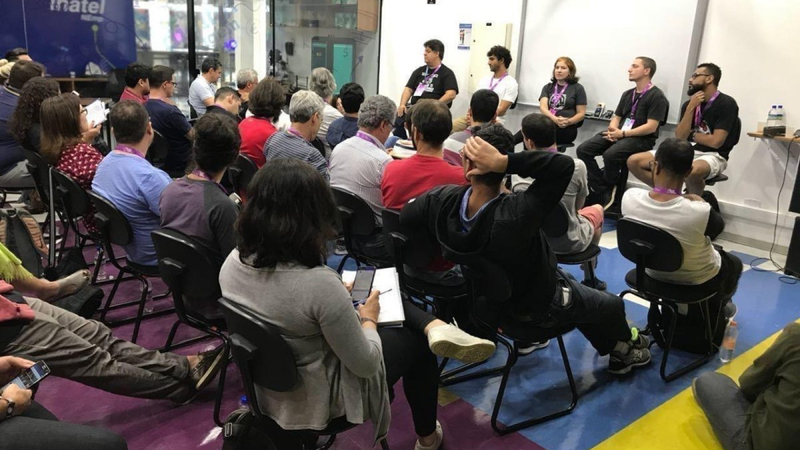 Luiz also participated In a debate with other blockchain enthusiasts such as Solange Gueiros, Fausto Vanim, Courtnay Guimaraes and André Salem about blockchain’s challenges & opportunities in Brazil. Participating on the HackTown was a great experience, and we want to be there next year. We would like to thank Huobi Brasil for sponsoring the hackathon with us. Also all the support we got from the BeSpiral crew : Ranulfo Paiva Sobrinho @ranulfo, Karla Córdoba-Brenes @muguika, and Julien Lucca @julienlucca. They were terrific mentoring the teams, sharing knowledge and collaborating with their practical experience. That’s how EOS Rio came back from Santa Rita do Sapucaí. Understanding that education is a crucial factor to grow EOS adoption. We’ve been trying to do it by non-scalable things first in Brazil. That’s why we’re organizing and sponsoring hackathons & meetups around the country. Education & community building. These are keywords for growing EOS adoption. The more people learn about our platform, more people will start using and talking about it. We hope to see you in London or São Paulo!